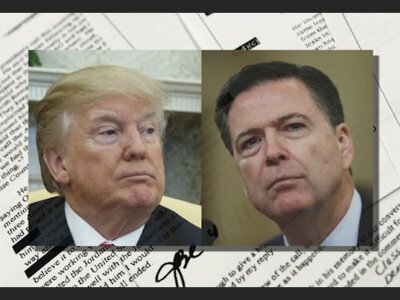 WASHINGTON (AP) — James Comey and President Donald Trump seem to disagree on most everything, but the ex-FBI director’s memos show consensus on at least one thing: the need to hunt down leakers. The jocularity over leakers and journalists is striking given the otherwise tense nature of their conversations, which touched on loyalty pledges, Russian prostitutes and open FBI investigations. The memos kept by Comey show his unease with Trump’s requests and his concern that the president was blurring the bright line between politics and law enforcement, including with a request that he end an investigation into former White House national security adviser Michael Flynn. Trump was referring to the memos Comey wrote documenting his conversations with Trump before he was fired. Comey asked a friend to release them to the press. Comey has said he hoped the memos’ release would lead to the appointment of a special prosecutor to investigate Russian election meddling and potential coordination with Trump’s campaign. The memos, which were obtained this week by the AP, were unclassified, though some portions were blacked out as classified. Yet Trump and Comey were clearly on the same page about leaks, even if they weren’t quite in agreement on whom to hold accountable for them. Comey recounts an Oval Office conversation from February 2017 in which Trump raises the prospect of jailing journalists who benefit from leaked information. According to the memos, Comey told Trump it would be tricky legally to jail reporters but said he saw value in going after leakers and “putting a head on a pike as a message” by bringing such a case. “They spend a couple days in jail, make a new friend, and they are ready to talk,” Trump says in one memo. Comey laughed as he walked out of the room, according to the memo. Comey’s memos had been eagerly anticipated since their existence was first revealed last year, especially since Comey’s interactions with Trump are a critical part of special counsel Robert Mueller’s investigation into whether the president sought to obstruct justice. The documents cover the early months of the Trump administration, a period of upheaval marked by staff turnover, a cascade of damaging headlines and revelations of an FBI investigation into potential ties between the Trump campaign and Russia. The memos reflect Trump’s uneasiness about that investigation, though not always in ways that Comey seemed to anticipate. In a February 2017 conversation, for instance, Trump told Comey how Putin told him, “we have some of the most beautiful hookers in the world” even as the president adamantly distanced himself from a salacious allegation concerning himself and prostitutes in Moscow, according to one memo. Comey says Trump did not say when Putin had made the comment. In another memo, Comey recounts a private White House dinner in which Trump pointed his fingers at his head and complained that Flynn, his embattled national security adviser, “has serious judgment issues.” The president blamed Flynn for failing to alert him promptly to a congratulatory call from a world leader, causing a delay for Trump in returning a message. The foreign leader’s name is redacted in the documents, but two people familiar with the call tell the AP it was Putin. They were not authorized to speak publicly about the matter and spoke on condition of anonymity. The following day, Comey says, Trump cleared the Oval Office of other officials and encouraged him to drop the investigation into Flynn. Flynn pleaded guilty to lying to the FBI and is now cooperating with Mueller’s investigation. The memos were provided to Congress as House Republicans escalated criticism of the Justice Department, threatening to subpoena the documents and questioning officials. Associated Press writers Tom LoBianco, Jonathan Lemire and Zeke Miller contributed to this report. Comey's memos, as obtained by The Associated Press.